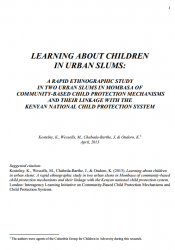 The purpose of this research is to learn about community-based child protection processes and mechanisms in two urban slums in Mombasa, Kenya. The research focused on diverse sources of vulnerability such as those related to HIV and AIDS as well as the issues that fit under the traditional child protection rubric. In particular, the research seeks to identify how local people understand children and childhood, what they see as the main harms or risks to children, what community based child protection mechanisms (CBCPMs) exist and how they are used, what protective factors enable children’s positive coping and resilience, and whether and how the CBCPMs link with elements of the formal, government led aspects of the national child protection system. Recognizing that people in urban slums may be positioned in very different ways, the research aimed to disaggregate responses by age, gender, socio-economic status, and, to a lesser extent, religious orientation. This research is part of a wider, inter-agency learning initiative that aims to contribute to strengthening the national child protection system in Kenya.